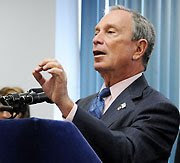 Mayor Bloomberg dealt Bruce Ratner a blow on Wednesday, saying that the city would not subsidize the Atlantic Yards project with additional public funds. The city has already pledged $230 million for infrastructure and land-acquisition costs at the embattled arena and skyscraper project — but Bloomberg dashed Ratner’s hopes for more. So why not do the same thing at Willets Point? Invest in streets and sewers and let development take care of itself.